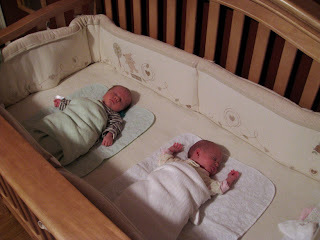 Ever since we've had the twins they have been sleeping side by side in their crib. They are such good sleepers - even one crying wouldn't wake the other up. One month old here - the crib was so spacious back then! So, this past weekend, we put another crib in the nursery - and Ava moved out! No problems with the transition... I think that Ava is very appreciative of her new space, especially since we put a pretty girl mirror in her crib. I wouldn't call her vain, I just think she likes to look at someone other than her stinky brother. Sorry Colin! I just had to take a video of them waking up yesterday since we were thrilled that they slept from 9pm until 7:15am through the night without waking up at all... that's a regular occurance for Ava, but Colin usually wakes up at least once. Love those rare all-nighters! Bonus cut of Ava at the end of the vid... I just thought she was being cute. Love the stretching! I miss that a little now that we don't swaddle Penny. Such sweet smiles. I get a couple of smiles and then it is a "feed me, dammit" that takes control of them. OMG! Where is the screaming..the red faces...and the crinkled tongues..the quadruple swaddle with a slipknot and still a hand poking out by the face?! They are such little angels...you definitely lucked out!